What do you see when you look up at the stars in the night sky? Do you just see sparkling lights? Do you recognize a dipper with a handle? Do you see three bright stars in a row and think of Orion, a figure from Greek mythology? 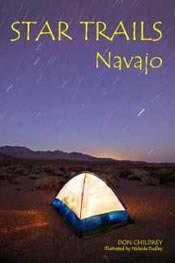 STAR TRAILS – Navajo is a book about Native American star lore. 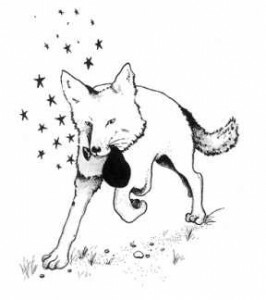 The Navajo people of the American Southwest have their own set of star figures and legends to describe the sparkling lights we see on Father Sky. Inspired by evenings spent camped out under dark backcountry skies and the interesting stories told by many Native American tribes, this book will entertain and inform you. STAR TRAILS – Navajo is sort of a camp-chair guide to the night sky for those more intrigued by Native American sky lore than ancient Greek mythology. After you read stories explaining the origin of Navajo star figures, you’ll find sky charts and drawings to help you locate these celestial patterns. Additional tidbits of information from other cultures is included to round out the presentation. Scientific details about individual stars are also provided to help you gain an understanding of contemporary science’s view of the night sky. View a few sample pages from STAR TRAILS – Navajo. Self-published in 2004 by DTC Publishing. Updated in 2008, 2nd edition paperback. 2nd edition print copies are also available through CreateSpace. Used 2nd edition copies are sometimes available on Amazon.com. A Kindle Edition is now available through Amazon.com.